Is Buying Leads a Waste of Money? There are a lot of vendors in the world trying to get people to buy their leads. This process is not new and is used a ton, especially in industries like insurance sales, real estate, and car sales. But the question is often asked whether it is a waste of money to buy leads or is it still a valuable marketing tactic. 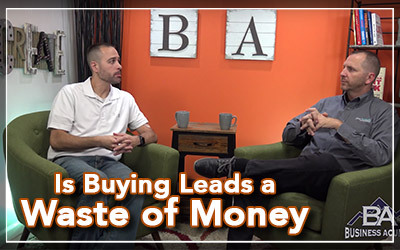 In this episode of Business Acumen, Joe Manns and Roy Browning discuss the value of buying leads. The debate really comes down to two simple questions and that is: Are you buying quality leads, or are they stale? In the digital world, we are moving so fast that a lead that is hot today could be cold tomorrow. When we are putting good money into buying leads we want to know that they are going to be hot and ready to purchase. But we cannot guarantee that experience. How do we stay relevant when buying leads? Below are two ways to procure leads that will result in better quality. The list goes on and on, but anything you can give away that is a valuable resource for someone will likely yield that person's contact information (at least an email address). Each of these tactics can be combined with a paid outbound marketing strategy to drive more people to these resources. How can you filter their leads so you get the ones that are the most applicable to your business? Where did the data came from (was it gathered by the company directly or was it purchased from other companies)? Was the data verified by multiple data sources? With email addresses you can send an email for free to qualify the lead on your own before you have someone start calling. Qualifying questions (polls) in emails that ask if the person is still in the purchasing process. Perhaps you are a real estate agent and want to know if someone is still looking to sell their house. You could send a poll email that has two buttons; Yes, I’m trying to sell my house. Or I’ve already sold my house. Check out our other blogs and if you find value in them, consider subscribing to get updates when we post new content.